Spectra is the amazing new acne system that stops acne in its tracks. It is 99.9% effective at killing bacteria that causes acne and produces visible results in as little as just one application. The difference is clear with Spectra. It only uses only natural ingredients to combat acne. There are no harsh chemicals such as Benzoyl Peroxide and it is also oil-free. Spectra was created by Dr. John Alexander, a board certified plastic surgeon. He created Spectra as an acne system that reached deep down into the skin in order to effectively eliminate acne causing bacteria. 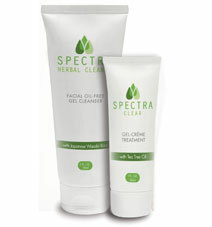 The two products in the system is the Spectra Herbal Cleanser and Spectra Clear. 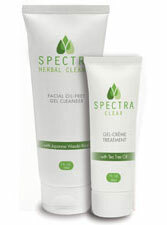 Spectra Herbal Cleanseruses all natural ingredients to eliminate acne bacteria, deeply cleanse the pores and restore the skin to a natural PH level. Spectra Clear also kills acne causing bacteria, regulates the skin’s oil production and reduces redness and inflammation. Found in Spectra is the patent-pending Liposomal Technology which allows the ingredients to be be delivered deep into the skin for maximum effectiveness. Many other acne products do not work because they cannot penetrate the skin’s outer layer to treat acne at the cause. The retail cost of Spectra is $59.95 for a 30-day supply. Currently there is a special online only offer where you can get a 14-day free trial of Spectra by paying $6.95 for shipping and handling costs.